Lightning forces emergency evacuation in Malaga | Marbella Marbella – Adelante! 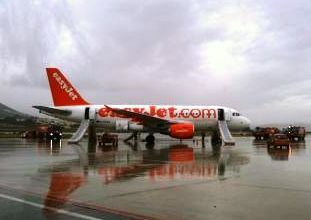 Passengers on a Gatwick to Gibraltar flight friday found themselves sliding down the emergency shutes of their aircraft after landing safely at Málaga, where they had been diverted by bad weather on the Rock. The plane was apparently struck by lightning and, according to AENA, the airport managing company, the measure was taken as a precaution by the captain. The lightning struck after the plane had already come to a standstill, and there were no injuries. The passengers found themselves safe, shoeless and a little shocked in the terminal. One report said that the smell of smoke had set off the alarm in the aircraft.This incident comes amidst extreme bad weather. Local weather conditions will also be impacting on flights for the rest of the week. The authorities at Málaga, Gibraltar, Jerez and Sevilla advise that you check with your airline before travelling to the airport.